St Mawes is set in lovely grounds within a breathtaking location. 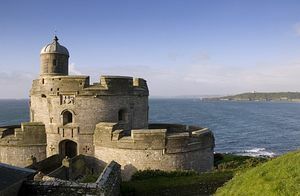 It is the most picturesque of Henry VIII's costal fortresses, and the best preseved. Facing Pendennis across the glittering bay of the Fal estuary, the castle commands magnificent views which you can best appreciate from its mighty battlements. During its 450 years the castle has had mixed fortunes. You can see evidence of these as you explore its wonderful architecture and enjoy the free audio tour that brings this turbulent history to life. In St Mawes off A3078.